Today Fletcher performed in his annual Treble Makers Christmas concert. It was the cutest thing EVER! He completely stole the show. They combined his little group with another group, some of them playing drums and Fletcher had a 'solo' with his voice output switch. It went a little something like this...Fletcher's music therapist sang 'Mele Kalikimaka' and Fletcher hit his switch perfectly each time she was supposed to say 'to you'. 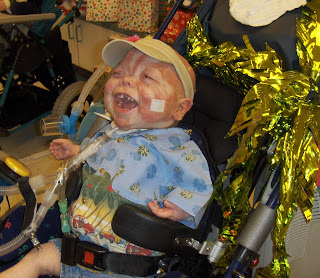 Fletcher's speech therapist recorded 'to you' into his voice output switch for him. He was amazing today! Fletcher wore a cute Hawaiian shirt, shorts, sandals and his favorite visor. Precious! I videoed it, of course and when I came home tonight, excited to show all of you this priceless performance my camera wouldn't let me upload the pictures or the video!!!! I'm hoping my computer genius husband can figure something out with my camera. So, until then you'll just have to imagine just how cute Fletcher Burns was today! 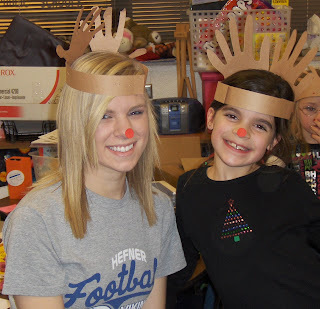 Maddie Burns has had four Christmas parties this week! Kayleigh was exempt from all of her semester test today except one. So I picked her up at noon and she ran errands with me and also helped with Maddie's Christmas party this afternoon. Maddie was so proud to have her big sister at her party! All of her little friends have heard all about Kayleigh, I'm sure. Kayleigh told me today several of the kids would just come up and hug her. Kayleigh and I thought that was sweet. But I am glad all the parties are over! I have finished my Christmas shopping and it's all wrapped and under the tree. I'm determined to enjoy the next five days and hopefully reflect on the true meaning of Christmas. I love Christmas but in all honesty I get caught up in all the hype. I want my children to realize and appreciate the true gift the Lord has given us...His Son. We'll bring Fletcher home on Christmas Eve and he'll spend the night in his home. This is such a blessing. A blessing to have him wake up at home on Christmas morning with his sisters. The Lord is so good to us. Fletcher's going to be four on December 30th. I can hardly believe it! My baby is four! Today I've been emotional as I've thought about the last four years. Unfortunately with each of his birthdays I tend to head in the wrong direction. The direction of all he's NOT doing. My sweet nephew Logan, who is six months older than Fletcher, came to our house last Sunday. As much as I try not to compare, it was really hard watching and listening to all that Logan is doing. Oh you know, walking, talking, saying things in a cute, fun four year old way. Logan's right on track and Fletcher isn't. Oh but the things Fletcher can do that we NEVER thought he'd be able to! Like I said, God is good to us. He always helps me to go in the RIGHT direction. 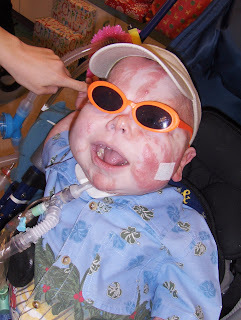 Five days after Fletcher's third birthday he was in the PICU on his 'deathbed' as I'm sure you all remember. And just look at him today! I promise you he's stronger and smarter than ever! Only the Lord can do that! 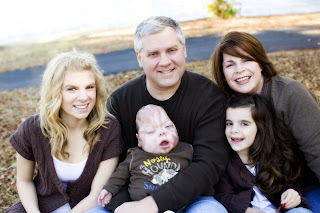 This year Fletcher will celebrate his birthday, for the first time, at home. It will be a come and go party, and we'd love for all of you to stop by and say hi, if you get a chance. At this point I haven't decided what day we'll celebrate but check back in a few days and I'll post something! Hopefully I'll be posting the cutest video also! :) Talk to you soon! Oh yeah, and Merry Christmas! Very good job. That is one of my favorite Christmas songs. I'm sorry that you struggle with the comparison issue. I think that all mothers do that from time to time no matter what the situation. I can tell that Mr. Fletcher is making progress by leaps and bounds just in the time we have been bloggy buddies. Have a very Merry Christmas!! oh my goodness. That is so cute!! I love how he is dancing. he did a fabulous job. Love the family pic too. I LOVE LOVE LOVE LOVE LLLLOOOOOVVVVEEEE your family picture!!! It's amazing & beautiful! !